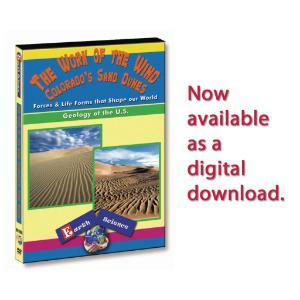 Discover The Wonders of Our Earth and the forces and life forms that shape our world with the Earth Science Series. Designed specifically for the middle and high school science classroom, this series introduces students to the various geologic forces and physiographic regions that have shaped our planet. The Great Sand Dunes, almost 700 feet high in central Colorado, is the site for this earth science program. Students will learn how a dune is formed, the various kinds of dunes (barchan, transverse and longitudinal) as well as the origin of these sand dunes near the Sangre de Christo range.